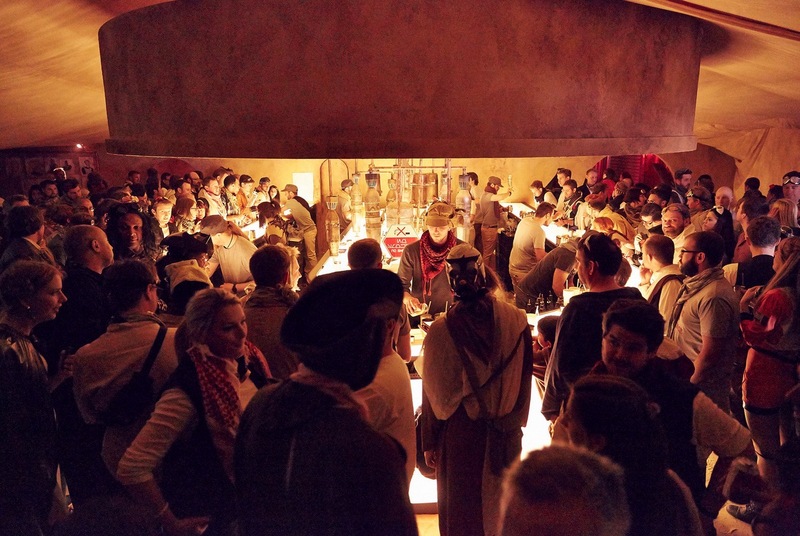 As I eluded to in Geektown Radio a few weeks ago, I recently spent an evening in a galaxy far far away (otherwise know as a large warehouse in London), courtesy of the rebel scum at Secret Cinema. Last year they took people back in time with their Back To The Future extravaganza, but this year sees them take to the stars with Star Wars: The Empire Strikes Back. Your journey starts before you even get to event, with you being assigned a role and a character to play when you get there. I should say, if you are going to go, get dressed up. You don’t have to of course, and the night I went there were people who put in various levels of effort. However, I rather got the feeling the more effort you made, the more likely you are to get singled out in the interactive story playing out in front of you. Once you’re arrive at the secret location, you’re thrown into the world of Star Wars and… well, I don’t want to say too much as to spoil it for people… But its fair to say, you get to visit some key locations, and meet some well know characters as you’re guided through an interactive story set in a universe we all know and love. The pre-film sections are just brilliant fun. The ‘space’ split into 2 main locations, and whilst I enjoyed ‘location 2’, for me, ‘location 1’ was just phenomenally good. There’s a kind of lacklustre review in one of the national papers today about how the film “wasn’t of interest” to people and they preferred to hang around the bar… Well, of course you idiot, you’ve rather proved how you totally missed the point… We’ve seen the film hundreds of times! This is the one night you can actually STAND in one of the locations from the film! The actors are great throughout, from the ‘feature’ players to the stall owners and bar tenders (bring a credit/debit card, then don’t take ‘earth money’). No one broke character. They were also brilliant with the kids we had in our group. 10/10 – Feels like you’re in a galaxy far far away! ← The World Loses A Legend – Sir Christopher Lee has Died (1922-2015). 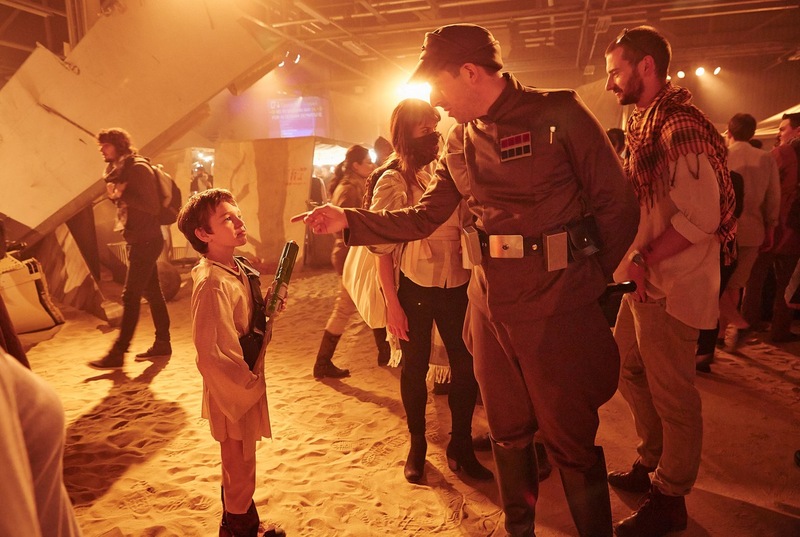 I went to this over the weekend , and thought , once again secret cinema did a great job recreating some of the sets , costumes ,and some fun aliens and characters .and feel of the Star Wars universe . ;- there was some interaction with actors and characters , and a couple of scenes played out in front of you to enjoy , and have fun , with …jawas trying to pinch my things and being threatened by stormtroopers , all good fun , as was the film . I dont think it justify’s £70 a ticket ,. plus more money for food and drink , even if you are die hard fans of the film . it was confusing having things from “new hope ” with “empire “, why not crete ice planet Hoth .? Darth vader looked too short , and the light saber fights were not as exciting as they could have been – seen better by actors who did it in the film , why not get them .?? Also seemed odd no R2D2 or C3PO around, and could have had more mirror scenes . Went to this last night and couldn’t agree more with your review. Once in a life time experience and well worth the money. All the staff are perfect and the community very friendly.